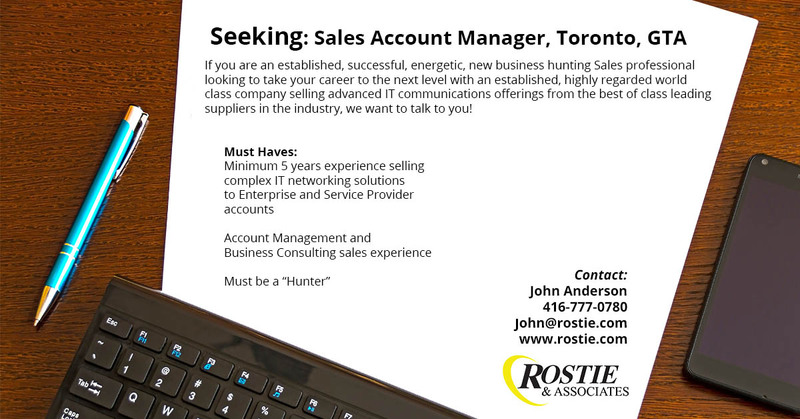 Sales Account Manager - Rostie & Associates INC.
Our client, a Canadian based information technology network provider is seeking a Sales Representative in the Toronto area. In this position, you will: Successfully promote, develop and sell the company as a full service, high value-added IT network systems integrator into new Enterprise and Service provider accounts across Canada; Develop and maintain multiple levels of account relationships with medium and large accounts; Develop strategies and tactics to acquire new Accounts; Possess and maintain an exceptional level of technical knowledge of the company's broad array of products and services; Develop new business models with things like IoT, both inside and outside of existing client base; Qualify, develop, and close sales opportunities to meet/exceed required sales targets in both the product and services categories; Work in a team like manner with all external business partners to develop best in class offerings to our customers' challenges and needs; Maintain a solid understanding of the overall technology sector and market changes, from basic requirements to major industry impacting directions; Engage, develop and deliver compelling high end, high value customer presentations. The ideal candidate will have: 4 - 6 years of experience with a proven record of success in IT Networking sales, detailed account management and business consulting sales skills; A track record of making quota / closing forecasted deals, including solid weekly forecasting, account heat mapping, pre and post sales process, and ongoing account management skills in both Enterprise and Service Provider accounts; Work effectively and cooperatively with Inside Sales, Administrative logistics and technical teams; Relentless pursuit in driving sales opportunities through the sales forecast funnel to closure; Proficiency and deep understanding of complex networking solutions is imperative; Competitive adeptness in setting the stage, business savvy, a strong customer focus, self-confidence, and an ability to manage business relations; A proven ability to develop long-term and mutually beneficial relationships with large accounts, including some expertise at financial modeling and executive level deal discussion; An existing base of strong relationships with new prospective accounts; Self-starter, independent worker, intelligent and driven to succeed - strategic and tactical; Proven winning RFP response experience, including thorough working knowledge in using all Microsoft office tools; A university degree in business or related area will prove to be an asset; Well spoken, presentable, good communications skills (written and oral); Excellent qualifying skills, closing skills; Authorized to work in Canada.